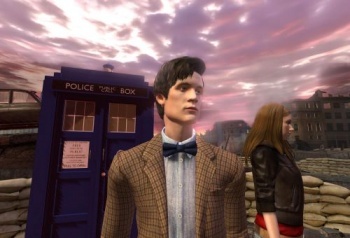 The Doctor Who adventure game has proven to be a hit after more than half a million downloads of the first episode. More than 500,000 people have downloaded City of the Daleks, the first episode of the Doctor Who adventure game, since its formal release twelve days ago. The game was originally intended as an episode of the show itself and sees the Doctor and Amy attempting to undo damage done to the time stream by the villainous daleks. "To say we're thrilled that we've received in excess of half a million download requests within the first 12 days is an understatement," said BBC multiplatform head Simon Nelson. "The project has been a real labor of love from the whole Doctor Who and multiplatform team, so we're delighted the reaction has been so strong." "The response has been tremendous - with almost universal praise from Doctor Who fans. It's clear we've got people playing these 'interactive episodes' who wouldn't ordinarily play through a computer game - and the opportunity to actually be the Doctor is hugely appealing." The second episode of the game is set to be unveiled in Scotland next week. Those living within the UK can still download the first episode for free, and an international retail version of it will be available next month.